Have you ever get bored during a presentation? In reality, It is common for most teachers and speakers to experience lack of attention and poor interaction during their presentations. Beyond the problem of attention, making presentations poses serious challenges related to information exchange, slides management and handling groups under a methodology that is usually passive. However, slides presentations and especially Powerpoint is very popular, with figures showing a market of 120 million people and about 30 million presentations created every day. Flipwit is developed as a solution for many of the problems previously mentioned. 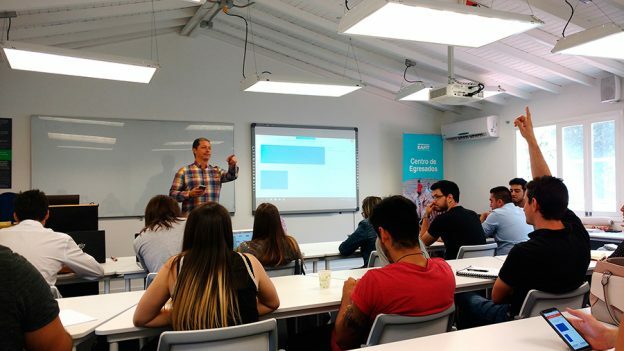 We apply neuroeducation concepts to find tools that help us to reactivate the attention and provide didactic alternatives during Powerpoint presentations. Even if we were initially focused on the educative usage of Presentations, our features have transformed Powerpoint in a powerful tool for speakers, entrepreneurs, salesmen and everyone interested in communicating effectively a message through a presentation. 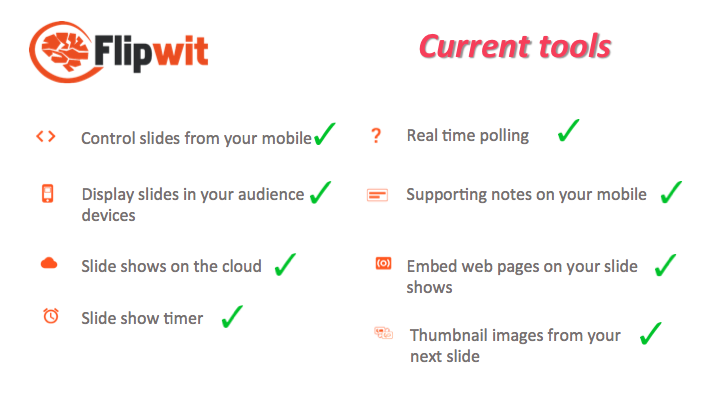 The first version of Flipwit let you get access to your presentations from any device, display slides in your audience devices and interact with them through polls and quizzes. In addition, it allows you to control and browse slides from your mobile, manage the time during the presentations and include web content on your slides. These tools boost your presentations, show you like someone innovative and convincing and also promotes the participation and enhance learning. The interaction gained using Flipwit besides of reactivating the attention, it allows you to collect information that can be useful to explore the preferences of your customers and students adapting your presentations to their needs. Despite offering all these benefits, our effort for improving the possibilities with Powerpoint goes beyond. We are currently developing new features to make your presentations reach a new level…. Through the new features, you can send automatically documents to your audience, save the answers to your polls, get attendance lists automatically, include youtube videos in your presentations and use the software offline. These tools let you save time when you share documents or promotional material, ease evaluation and tracking to students and clients and also let you use all the Flipwit tools in places without an internet connection. As you can see, we have included tools to simplify the management of your presentations and give you communication alternatives. In addition, our tools include emotion and social interaction during your presentations. These benefits enhance learning and information recalling making your audience enjoy while they receive the information you want to share. What are you waiting to improve your presentations? If you are not a FLIPWIT registered user we invite you to get a FREE TRIAL. This entry was posted in Sin categoría and tagged effective presentations on 7 March, 2018 by Flipwit.